We call Chanukah the Festival of Lights. Each of us has a personal sense of what the lights symbolize. Each of us finds personal meaning in Chanukah. I have met Jews who try to make the Chanukah lights compete with Christmas lights. One former congregant described how he would decorate his lawn and house with an illuminated display that outshone all the houses around him. I know other Jews who do not want their children to be deprived, so the “eight nights of gifts” becomes their real Chanukah lights. Jewish musicians I know try to create Chanukah light through their art. Yes, music can provide a very powerful light. It is emotive. It sparks the light of imagination. I see the Chanukah light differently. I see it in a very personal way – a way that relates to aspects of my life. I love my Chanukah memories from childhood. When I was young I often spent Chanukah at my Oma and Opa’s house in the Bronx. All of my family was from Germany, and my grandparents lived in an area of the Bronx where many German Jewish families had settled. These families would throw Chanukah parties and I would attend. One feature of them would be the appearance of the “Chanukah Man.” I know this seems kitschy and yes the Chanukah Man was a kind of rip off of Santa Clause, but apparently it was a big German/Jewish thing. When I was four I remember attending a party and the Chanukah Man’s appearance was much anticipated by us children. Sure enough, the door to the family room opened and in he came, white beard, pseudo Tevya like clothes, peasant’s hat, and a long staff with a Jewish star on top. He sat down and began to have each child sit on his lap and ask if they had been a good boy or girl. What I did not know was this Chanukah Man was my dad – in disguise. When it was my turn I sat on his lap and looked down at his shoes. My dad wore special orthopedic shoes, so they were pretty identifiable. When I saw the shoes I said, “Gee Chanukah Man, my dad has shoes just like those.” Without missing a beat the Chanukah Man/Dad replied, “Well, we use the same shoemaker. I see him there all of the time.” I did not know it was my dad until a few years later when I had figured out there was no such thing as a Chanukah Man, and I guessed the one at the party must have been Dad. My dad’s uncle Richard was like his father – he raised him. Uncle Richard was like a grandfather to my brothers and me. He loved to play the Chanukah Man. He lived in Allentown, PA and we moved there when I was nine. I knew, of course there was no Chanukah Man, but my younger brother still believed. So Uncle Richard dressed up like the Chanukah Man and came to our house with gifts. My brother, however, was scared out of his mind, ran upstairs and hid in his room. My favorite Uncle Richard/Chanukah Man story, however, is this letter my brother and I received one year. Please note the spelling. I still have that letter. The return address on the envelope reads: 18 Matzoh Ball Street, Tel Aviv, Israel. That letter is one of the few physical reminders I have of him. He was one of the few true heroes I have personally known. This begins with the lessons I learned from Uncle Richard’s life. Here was a person who saw his world shattered. He lived in Germany – a decorated German soldier in World War I. He took in his sister and her son (my grandmother and my father) after my grandmother’s divorce in 1926. As the Nazi oppression of Jews began in 1933 he distributed anti-Nazi leaflets, wore his Iron Cross in protest and was arrested. He spent the 1930’s trying to get the family to a safe place, finally getting to America in 1939 just as the war was breaking out. He voluntarily returned to Europe as an American GI, winning the Silver Star but also seeing the destruction wrought by the Nazis on Jews first hand. Yet, Uncle Richard was a person who never lost hope. I believe he had the courage to do the things he did because he always had great hopes for the future. A collage of his pictures and his medal hang in my office – an inspiration of hope to me. Uncle Richard passed his hopeful outlook on to my dad. Dad also lived through some terrible times. He also fought in World War II. He could have easily felt bitterness towards the Christian world, given his experiences in Germany. Yet, Dad was not afraid to move his family to a small town in West Virginia. There, he taught me by being an integral part of the tiny Jewish community. He also taught me through his friendships with non-Jews. His attorney, my “Uncle” Harry was not Jewish. Among his closest friends was a Baptist minister, whose son found me a few years back and with whom I am still friends. We would go to the minister’s house to trim their Christmas tree. Dad knew every Christmas carol in German, and would sing them. So he taught me one could celebrate with Christians without compromising your Jewish identity. Dad could do all of this because he was a person of hope. He hoped the world could get better after the horrors of the Holocaust. I see hope every day, through my work. It is the hope inspired by teaching children, seeing them learn and achieve a level of Jewish literacy. I see hope by the bridges built throughout the Tallahassee community. I see Jews and non-Jews who really understand that we are in this adventure called life together. I see hope in the Christian clergy I interact with, the respect they have for the Jewish community and their dedication to the overall welfare of the greater Tallahassee community. I see hope in the cooperative interfaith work our congregation does with a number of local Christian churches. I see hope in the way people of all stripes work together to improve our town. Yes, we have problems. We are not perfect. But I believe our town is a model for how people of different backgrounds can come together for the common good. So I see a light of hope. It begins with our holiday cycle. Chanukah is only one stop in the yearly journey through the calendar. Note that candles are lit for every major holiday, beginning weekly with Shabbat. Light is not exclusive to Chanukah. It is ever present on the Jewish calendar. And, most of our holidays express hope – even the serious ones. The High Holidays give us the light and hope of repentance – that we can improve our lives and relationships. Sukkot fosters an appreciation for the bounty of life. Simchat Torah the joy and light of engaging in Torah. Purim is just pure fun. Pesach reminds us of the hope for redemption, even in the worst of times. The lights of Judaism shine throughout the year. They inspire. 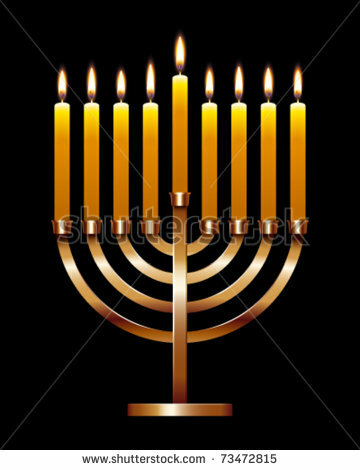 Most of all, the Jewish light is one which teaches us how make our lives be a light unto the world. Our cycle of holidays, each year of Jewish celebration teach us that our lives do not revolve around the celebration of any particular holiday, but whether our whole lives are a celebration – of something greater than ourselves.